Post # 247 Happy Beltane! April 30, 2014 at 4:00 PM | Posted in Uncategorized | Comments Off on Post # 247 Happy Beltane! 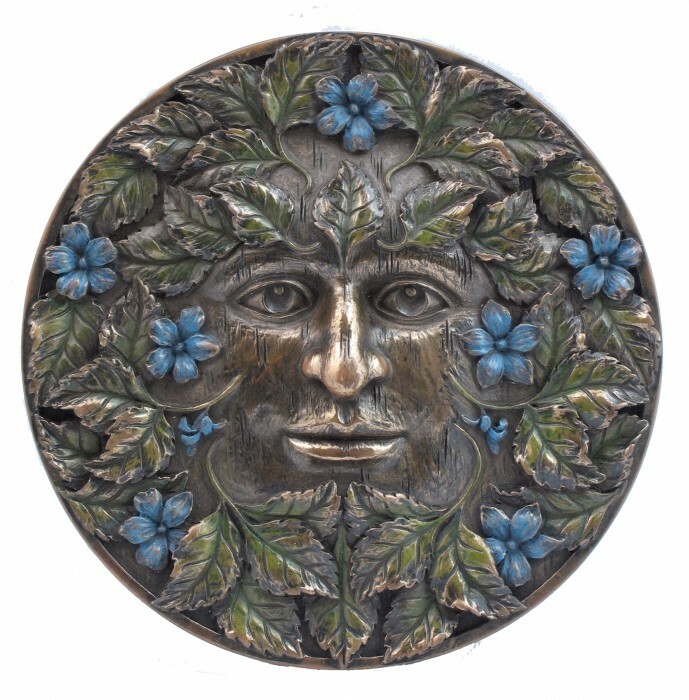 Beltane, May 1st, May Day. It’s been celebrated since the beginning of mankind’s life on the planet. It’s the real beginning of warmth, at least in the Northern Hemisphere. Plants that were sown at the beginning of Spring have sprouted and have thrived (hopefully.) The people of older times now felt comfortable in the new harvest. Even the earth itself seemed to be celebrating with a profusion of color as wildflowers and trees and grasses, even weeds all broke out in blossoms. That certainly doesn’t help those who are afflicted with allergies, but there you are. Beltane, pronounced Bel-Tin or Bel-Tayn take your pick, as with the other holy days, was celebrated with a day of feasting and games. People believed that fairies went abroad at this time encouraging wanton behavior. In some places, fairies were invited to the celebrations; in others, the celebrations were to ward them off. As with all other celebrations, the primary focus is food. Fun and games, romps of all kinds are important, too. But the focus is food. Beltane is celebrating the “first fruits.” The milk producing animals have dropped their young and are producing enough milk to feed their family and the people who have them. The first shoots of plants are stronger but still tender. Fiddle Head Ferns can be harvested and eaten. Young asparagus can be picked and eaten right from the ground. Even green tomatoes can be sliced, breaded, and fried. Herbs, in particular, are starting to show healthy growth right now. My mints are looking incredibly good. My rosemary plants wintered over nicely and are tall and strong and bushy. 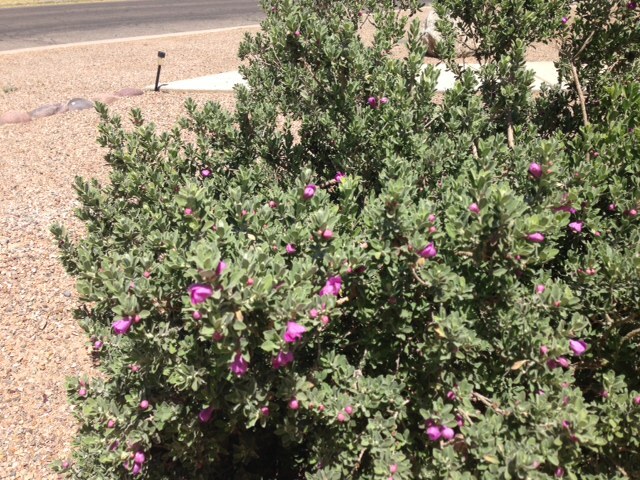 Our Texas Sage bush in the front yard just put out its first crop of purple flowers to show us he’s ready to grow. 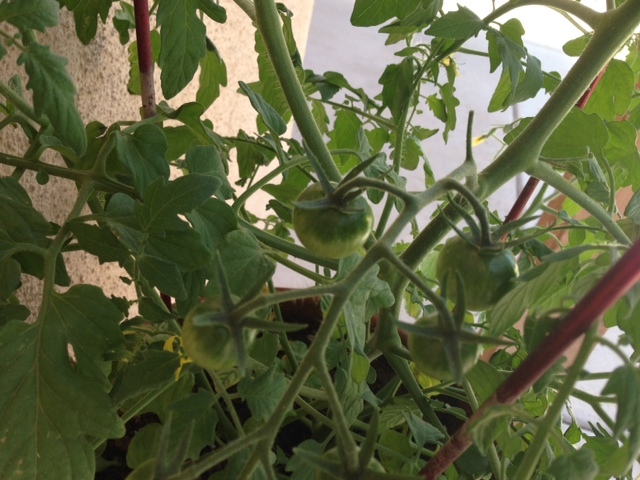 Even my one tomato plant, a cherry tomato and just one cuz I can’t go the whole year without vine ripe tomatoes, has a ton of little green balls that are going to eventually be tasty and juicy red fruit. The first honey is usually ready about now. It can be used to make wines, mead, baked goods, even medicines. When I was researching traditional Beltane foods, I was surprised to come across Strawberry Margaritas in one list! That same list included Bacon Wrapped Scallops and Chocolate Lava Cake so I think they were going more for the sensual side of the celebration. More traditionally minded are egg dishes that use the new growing plants and herbs. A Spinach Quiche is an excellent example. How many times have you been in the produce section of your supermarket and seen Spring Mix Salad greens? You can get them all year long, they’re just the early growth of the standard lettuces and greens you would see normally. But they’re more tender, and the flavors are milder. Making a salad with a light, fruit-based vinaigrette would be perfect at a Beltane feast. Add some mushrooms, or eat them alone raw or cooked. Just be careful to get these at a store, unless you’re absolutely certain what you’re picking is safe. Many mushrooms can be make you very sick, if not outright kill you. I was very happy to read, too, that one of the most traditional foods of the festival of frivolity is the donut. Since I’ve already made my taste for donuts known here, I won’t go into it except to say: yay! I’ll close now with a recipe for Angel Noodles with Fae Butter and a wish for you to celebrate May Day, Beltane, or just Thursday with as much fun and feasting as you can muster. In a small bowl, beat together hard egg yolks, sugar butter, rosemary, basil, and rosewater. Mix until very smooth. Boil water and cook noodles per instructions until al dente. Drain the noodles BUT DO NOT RINSE. Move noodles to a large bowl and add the butter mixture. Toss to coat well. Divide between number of servings. Chop egg whites finely and sprinkle over noodles. Place one orange slice per serving and have guests squeeze orange onto pasta. Most people don’t know this but 90% of your taste is in your nose. The nose and sinuses have sensors that react to scents and smells. Wiki has a very good, medium long article that explains it all really well. When receptors are tripped in either the nose or the mouth, taste is activated in the brain. Some of those receptors are pleasant and some are not so pleasant. Some are down right nasty. Ever notice when you have a cold and your nose is plugged up, nothing tastes good anymore? All those things we usually enjoy just don’t have the same impact they normally do. Only really strong flavors make it past the olfactory sensors to be picked and appreciated solely by the taste buds on the tongue. Garlic and salt are two of these, which is why chicken soup always seems to taste good when we’re sick. Ever been in a situation where something you find disgusting is another person’s passion? Or vice versa? Smell and taste are interpreted in the brain and are personal to each individual. When I first moved to DC, I shared an apartment with to guys in the Navy. They wanted me to do all the cooking so I asked what kind of things they liked to eat. They mentioned salads so the first night I made a big ole Trash Can Salad, which is basically everything you can lay your hands on. When we sat down to eat, I took a big bowlful, then a second one. Neither of them touched it. It was the same for the next two nights until the salad was gone. When I questioned them about it later, they told me I put things in the salad they didn’t like. It was the first time I’d ever met anyone who didn’t like tomatoes. I was floored. Neither of them did, so when I started eliminating things from the salad that they didn’t like, it turned into a bowl of shredded lettuce. But that’s how personal taste and smell are. In China one time, I was working with two teammates who didn’t like Chinese food. I love it! I was looking forward to eating it a lot while I was there, but that trip, I didn’t get any. One day, we were leaving for lunch and walked through the break room where several of the local staff were heating up their lunches. I wanted a bite of everything, wondering what it all was. It all smelled so good and my mouth was watering. When we got to the elevators, one of my coworkers turned to me and said, “That smelled disgusting!” My mouth almost dropped to the floor. But I ended up laughing as I told her how my mouth was watering. Some smells are pretty nasty, and can trigger some violent reactions in people. Nearly every critter on the planet will run away from the smell of a skunk. And when it’s a fresh, powerful, and potent dose, I will too. But after some time, odd as it sounds, I quite enjoy the scent of skunk. It doesn’t turn my stomach or make my eyes water. Don’t misunderstand me. I don’t go searching out the smell, and I don’t really want to linger in the vicinity. But it doesn’t turn my stomach, and I don’t run away screaming and heaving like so many other of the planet’s inhabitants. Just one of those odd things about the olfactory receptors and how the brain interprets them. Remember, I’m the one who does not like anything Ranch or Mayonnaise flavored, so whaddaya gonna do? Some people have chronic problems with their sinuses. The seem to be allergic to everything, constantly fighting infections. One of my old Navy roommates was one of these people. He was never without some nose spray hanging from his nostrils. He loved his food, though, but couldn’t quite catch the subtleties of flavor I was creating. Left to his own devices, he at tuna fish and minute rice all the time. He did love popcorn. He would make a big bowl of popcorn, dump half a cup of melted butter on it, then up end the salt shaker onto the resultant popcorn and butter soup. The first time he made it, he offered it to me and our other roommate. We both took a bite, and never at it again. About a year or so after we became roommates, he decided to have his sinuses scraped at the advice of his doctor. For a few days, he remained lethargic and woozy in his room, not interacting with anyone or anything. Eventually, things got back to normal and he found that he could smell and taste things better than every before. What the procedure does is goes into the sinus cavities and scrape away old, dead, and diseased mucus and remains that can’t make it out of the sinuses due to inflammation. Sometimes, as in roommate’s case, polyps are removed and need to be tested for other reasons. It’s painful, effective for a short time, but beneficial in the overall scheme of health. So after a week or so, roommate is sitting in the living room and decides to make popcorn. Humming to himself, he goes through the routine of popping corn, melting butter, and salting is as normal. He plops back down on the couch with his eyes glued to the television. He was probably watching some Disney show or movie. He was addicted to them. I watched as he put a handful of popcorn in his mouth. With his new found sense of smell, his brain was able to process tastes better, and popcorn soup was no longer the delicacy it had been. Post # 245 Medicine Ice Cream – A Short Story by Me! My dad loved ice cream. His mom was like that too, so I suspect his whole family had an unhealthy fondness for the stuff. I like ice cream, sort of. But I wouldn’t go out of my way to eat it. I have to be in exactly the right mood for it, and that seldom happens. But Dad, well, he can eat it 24 hours a day. His mom’s two favorite things were eating ice cream and driving, so her most favorite thing to do was drive to the ice cream parlor. I remember being very young and piling into her car and getting ice cream. My best friend in the whole world also loves ice cream and is about my dad’s age. Maybe it’s a generational thing. When we kids were in our early teen years we used to make homemade ice cream on the weekends all the time. Mom would cook the mixture; Dad would set up the hand crank; we kids would wait until it was time and then exhaust ourselves turning it and turning it. It always seemed to take forever. We always made vanilla, then added things at the end, like chocolate chips or fruit. I recall once, when we were still living in upper state New York, mom made ice cream out of snow, but I don’t remember that she did but the once. It probably didn’t turn out too well. Living in the desert like we did, buying ice cream to take home could be problematic. If we’d lived in town, it would be a no brainer. But we lived many miles out of town, about a half hour drive through orange groves and real desert to get to the sub-division where we lived. If mom bought ice cream while grocery shopping, it would be melted by the time she got home. So ice cream had to be bought last and at the last place on the way out of town. It helped if it could be put in a cooler with ice, but not always. When we first moved to the desert, the closest place to get a milk shake, or any other cold drink, was the truck stop two miles away. My little brother and I and all our friends would walk through the two miles of sand and scrub brush, dodging wasps and lizards, and trying not to get too terribly thirsty in that heat just to get a cold soda or milk shake. Sometimes we would try to hitchhike back to our house, but mostly it was walking back. My mom used to love to tell the story about the time there was a knock at the back door and when she opened it there were two border patrol agents. They had followed our tracks through the desert and wondered if she were harboring illegal aliens. Then, the truck stop closed down and someone opened a real live grocery store on the lot. It had everything we could ever want or need, and it was only two miles away. The thing that made it tops in my Dad’s book was they made fresh ice cream right there and packaged it in gallon tubs. He could get it home before it melted and enjoy ice cream of all flavors sitting in his own living room in his favorite chair. My dad is tall and lean. With his perpetual sun burned face and high cheek bones, many people mistook him for an American Indian. It didn’t seem to matter how much he ate, he always stayed lean. I never really saw him exercise or work out, but he was always active. He would eat a full dinner and have seconds and polish those off. Then he’d sit and read the paper, giving me just enough time to clean the kitchen and get all the dishes washed and put away. Then he’d be rooting around, looking for something else to eat. It drove my mom to distraction until she started stocking ice cream. Dad would eat the stuff right out of the carton so he wouldn’t have to mess up a clean bowl. He’d eat about a third of a gallon and put it away. The next night, he’d eat the next third of a gallon and put it away. The following night, he’d finish off the gallon. Then he’d put the carton down on the floor for the dogs to lick clean. The dogs were always smelling like soured milk from the ice cream that got on their fur and hadn’t been cleaned off. One time, my mom’s dog Bootsie got her head stuck in the carton and kept backing around the living room. Dad got a huge kick out of that. “Yes, it is, Papa.” Nephew replied. He was the oldest so it was up to him to make this one work. “No, it isn’t.” Dad asserted. “Why isn’t it, Papa?” Niece stuck her two cents in and when she looked at him with those baby blues I was sure he’d melt faster than his ice cream. It was true. No one was. It was hard for them to refute that logic so they went away disappointed. Dad fought the good fight for his ice cream longer than I ever would have. But his most brilliant tactic stumped the kids for a long time. “But why can’t we have any, Papa?” Nephew was relentless. Both the kids breathed an “Ohhhhhh!” of wonder and admiration and left him alone. They knew what medicine was. That one lasted Dad a long, long time. And the rest of us giggled quietly every time Dad brought out his medicine ice cream. It was usually vanilla. Most times he’d say yes, but if he was feeling generous he’d say no and give them several bites. Now, don’t get me wrong. Dad wasn’t mean or stingy. He just loved his ice cream. And he knew how angry the kids’ mom would be if he gave them that sugar loaded treat without her permission. Papa’s medicine ice cream became legendary with those two. I overheard them bragging to their friends about their Papa’s medicine could only be taken with ice cream, and that ice cream couldn’t be given to just anyone. Whenever I gave them a cone or a bowl of ice cream, I had to reassure them that it wasn’t Papa’s medicine ice cream. One time, they made me call him at work to make certain that the ice cream was okay. The specialness of that ice cream was brought home to me one day. The kids were still very little. Nephew was around 6, so Niece was about 4 or so. It was a normal, nondescript kind of day. Nothing that would stand out in anyone’s memory except for this. The kids were over for dinner and I had made a big pot of spaghetti. It was easy and one of their favorites. I had told them they could have some ice cream after dinner. But when I looked in the freezer, there was only one carton of ice cream and only about two thirds of it was left. I made a hasty call to Dad and told him to stop on the way home to get some. When he came in, he was empty handed and as soon as he saw me, he remembered. No one felt like getting out in the heat and getting more, so the ice cream was going to be completely gone after that evening. Dad took it with good grace. When dinner was over, the kids were itching to get to the ice cream, but they knew that they would have to wait until the kitchen had been cleared, the dishes put away, and order had been restored. So they asked if Papa would play a game with them. You could hear the thud from the kids’ faces falling when they heard that. It meant no ice cream, for certain. I’d have looked at those faces and figured out some way to get them some ice cream, but I wondered what my dad was going to do. It was like turning on a lamp in those faces. Their eyes lit up; their smiles lit up; and the excitement was palpable. All three of them trooped out to the kitchen where Mom and I got out of their way. This was obviously a grandpa/grandkids kind of thing. I listened to their banter as they put their bowls of ice cream together. Dad was trying to convince them that they shouldn’t have too much since it was, after all, medicine ice cream. Judging from the amounts in the bowls, he wasn’t very successful. The extreme special nature of this event made itself known a few short minutes later. The kids carried their bowls of ice cream to the living room as though they were holding fragile bowls of a miracle elixir. They walked slowly so as not spill a single drop. Halfway to their intended seats near Papa’s chair, Nephew turned to his little sister, his eyes sparkling with excitement. I don’t think any bowl of ice cream ever tasted better to them. Probably none ever did from then on. So food trends, right? Suddenly things that were once lost at the back of the pantry are popular and pricey. Wood fired cooking once was relegated to camping only. You started a fire in a fire pit, used a special set of blue-speckled enamel cookware and serving sets (which never ever came clean once used), and learned to cook from fifteen feet away to keep the ashy smoke out of your eyes. 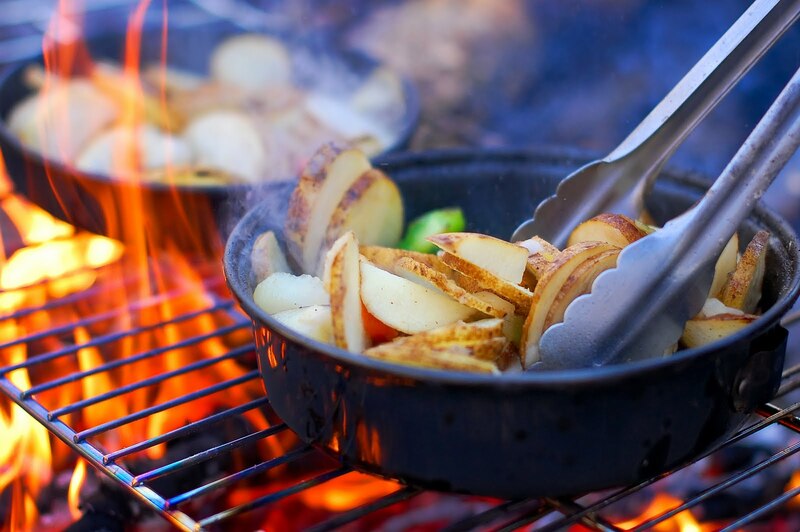 Seasoned, usually older campers taught you tricks for making stick-to-your-ribs delicacies. Normally, that meant grilling a fish, a side of beef, or a pot of beans. Over time, though, the selection changed, became more gourmet. Suddenly, using different techniques, different cookware, you could produce a full course turkey dinner including the pumpkin pie. Freeze-drying made heating water and adding it to an envelope of plastic a viable way to eat spaghetti and meatballs on the trail. Then wood fired cooking moved indoors. Restaurants started advertising their wood fired entrees. Pizza became crispier and tastier when cooked in a wood oven. Beef, mainly steaks, pork chops, lamb chops, chicken of all kinds started getting the grill marks and becoming tastier in the process. It led some low-rent restaurants to mimic the process by using stove top pans with diamond patterns to create “grill marks” that weren’t real. Some higher end home kitchens are now featuring the indoor outdoor cooker. You can barely turn on HGTV without hearing about the outdoor kitchen area. We used to just call it the corner where the barbeque grill was. That’s how you can tell this trend has come to stay. Along with the wood fire cooking trend came the food smoking trend. I’ll be honest. I like smoked meats in moderation. It has to be done right, in an unhurried fashion or it doesn’t taste good to me. If it doesn’t have the right flavor of smoke, I don’t want to eat it. Companies are smoking everything now. Butter is smoked; cheese is smoked; all kinds of meats and sausages are smoked. I’m waiting for the time when ice cream is smoked. (Of course, by smoking, I don’t mean rolled in paper, set on fire, and inhaled.) Smoking food permeates it with smoke and thereby cooks it on a very low heat for a very long time. Smoking also preserves the food by driving out the moisture which is what starts the spoiling process. Smoking has been around for centuries, but with the advent of refrigeration, it got lost by the wayside. It’s seen a resurgence in the past few years. In some upscale restaurants, you can get food smoked at the table, although that is primarily for the olfactory satisfaction, not much for the flavor. It’s even been on The Iron Chef competitions. You can buy smokers now that are electric, or gas, or charcoal burning. What happens is the heat element chars some wet or dry wood of your choice causing it to smoke. 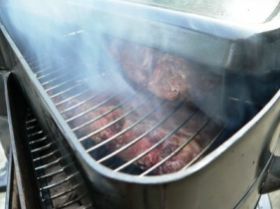 The smoke rises and permeates the food which is usually at the top of the smoker. The key issue is control. You have to control your fire so it doesn’t cook the food. In times gone by, smoke houses were completely separate from the fire source and were connected to each other by an underground tunnel. The smoke from the fire went through the tunnel into the smoke house where the food sat on shelves. Any day now, I’m anticipating smoked donuts. Not sure I’ll try those. When I was a teenager, I used to help the older couple down the block each evening by cleaning and straightening their food truck. It was the old style vehicle with two sides that opened up to show shelves full of sandwiches, burritos, rolled tacos, snack cakes, chips, and the like. There was a large bin full of ice to keep the milk and water cold. One side for cold stuff, the other side for hot stuff like coffee, etc. My job was to wash it down, restock, and make certain everything was ready for the next day. I hated that job. The food was okay, but smelly. Not what I would serve at all. And that was my impression of a food truck for the longest time. I’d see the same style truck around town serving faster-than-fast foods at so many pounds per buck. Quality was not priority one. Then at some point when I wasn’t paying attention, it changed. 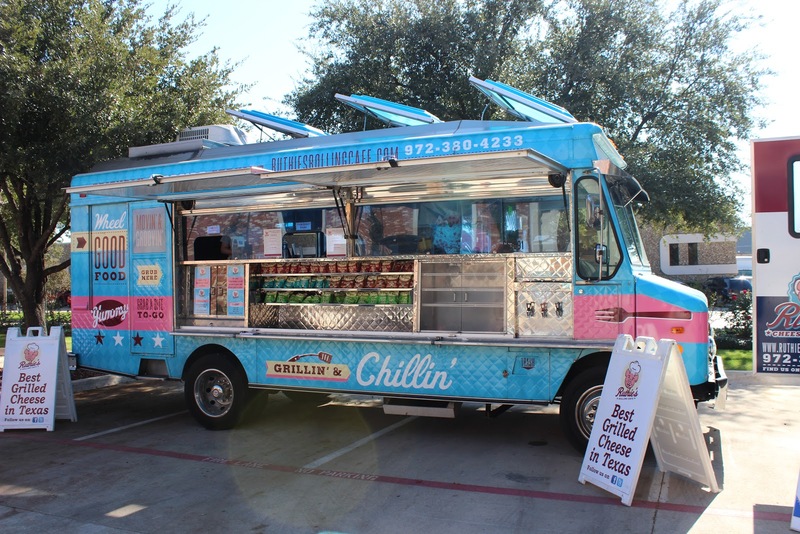 Food trucks suddenly became the go-to places to eat on the go. They worked hard to change their reputations and it worked. Eating at a food truck was “in” and not to be sneered at. Prices went up, but were still manageable by nearly everyone on the street. And the menus changed dramatically. Instead of just day old sandwiches and tacos, the cooks made everything to order, and you could order pretty much whatever you wanted. Trucks specialized. Some served only hot dogs, but in so many variations, it would take a month to try them all. Sandwiches still ruled, but you could get Philly Cheesesteak, or Mile High BLT, or Egg and Cress to die for. Ban Minh became popular, as well as other Asian delights. Anything you could get at a regular, high-end restaurant found its way to a food truck. Television shows abounded featuring food trucks, and mainstream competitions grew up. I was at a Concert in the Park last year and wanted something to munch on. We found a dessert truck and watched the chef (no longer just “the cook”) use a torch to put a crust on our Crème Brule, which was amazingly tasty. At a street fair, I got one of the best Indian Tacos (Indian Fry Bread with beans, cheese, lettuce, tomato, salsa, and jalapenos) I’ve ever had. Something else happened when I wasn’t looking. Cupcakes became the rage. And they aren’t going away. It used to be a cupcake was a small, paper-wrapped morsel with some frosting on top. When someone wanted cake for a party or celebration, out came a full size layer cake with decorations, or a sheet cake, also appropriately decorated. Now, you have entire stores dedicated to nothing but cupcakes. I’ve been to a few. The cupcakes have a bazillion different flavors, textures, or batters. Some are filled with jams, candy, creams, more frosting. Some are cheesecake, or red velvet cake, or pistachio flavored cake. Frostings can be anything from the traditional butter cream to whipped yogurt or frozen custard. Decorations are limited only to a person’s imagination. It makes sense that cupcakes exploded onto the fine dining scene. They’re small, easy to eat, and relatively guiltless. 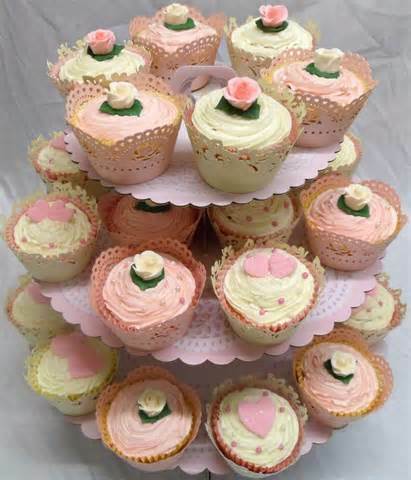 Even people on diets can say they didn’t eat a whole piece of cake, just a single cupcake. It sounds better. More on trending later. All this talk about food and stuff has made me hungry. I’m going to fix me a big bowl of mac and cheese, and maybe put some chopped bacon and tomato in it. With a bread crumb topping, it sounds like I just reinvented the BLT!! I know an old lady who is the most unintentionally funny person I’ve met in a long time. She’s my sister’s husbands’ mom and due to her advanced age, and the complications that accompany that, she lives with them. As I’ve mentioned a couple of times in the blog, because of ongoing work projects around the two houses, my BiL doesn’t have time to cook, so we’ve been cooking for the two households for several weeks now. The weekends are a little easier, but for the most part, we’ve been cooking for anywhere from 6 to 12 people every night. The Momster tends to be irascible and complaining, but she is mostly lucid and brutally honest. When she’s eating, she will tell you if she likes something or not. Loudly, at times. But she almost always goes back for seconds and thirds. But, she’s a sweetie, and as I said, so unintentionally funny at times that she keeps dinners interesting. A few weeks ago, we took dinner over. For whatever reason, there were only five of us at the table, while there were two people eating outside. I don’t even remember what the main meal actually was, but we’d made strawberry shortcake for dessert. Partner/Spouse cleaned and cut the strawberries in the afternoon and sprinkled sugar on them to macerate. As he was doing that, he commented that he wished we had some mint in the garden to add flavor. So I grabbed several leaves of chocolate mint that he cut chiffonade style and tossed into the berries. That evening, each person set up their own shortcakes and dug in. (I had just the cake and whipped cream cuz I don’t like strawberries.) At some point, I got up and left the dining room. When I returned, I asked someone if they’d liked the mint in the berries. The Momster piped up, “Is that what those were? I thought they weren’t cleaned right, so I didn’t want to eat leaves.” She had a small green pile on her plate. The whole room laughed out loud, and everyone I’ve shared that with has laughed. The Momster sits in the back sun room at a table doing word puzzles most of the day. We don’t cook at the other house; we bring all the cooked food over since it’s just a few feet away. She doesn’t always see the food arriving, and even though we’ve explained multiple times that we’re cooking and bringing the food over, sometimes, she just doesn’t get it. And when she’s tired or cranky, she speaks her mind, often loudly. We were clearing the table and since there was so much left over, we had talked about making something different with the leftovers. We bagged everything up and started taking it home along with our pots and pan and bowls. Suddenly I heard a cranky voice from the back room. “How come those guys are taking all our food and all our dishes?” I couldn’t help it and started laughing figuring I’d leave my BiL to handle his mom on that one. The funniest one was just the past week. We’d made tacos, and as a surprise, I made a double fudge bundt cake. Bundt cakes are a challenge to frost, so I drizzled chocolate syrup over it (triple chocolate cake!) and then sprinkled some coconut over the top for flavor and decoration. When we brought everything over, I had the cake. As I walked in, I heard my BiL telling the Momster that she could have dessert when she got back from whatever place she was going after dinner, probably bingo. So I showed her the cake, and asked, “Do you like coconut with chocolate?” I gotta say, it looked pretty. I went out to the kitchen to see where I could put the cake. The kitchen was swamped with bowls of food for tacos, and rice and beans for sides. And I wanted to keep the cake cool. My sister suggested putting it in the outside fridge where there was more room. I walked through the room where the Momster was sitting with the cake and headed to the door leading outside. She saw me walking to the door and hollered out. “Don’t take the cake! I’ll eat it! It’s good! I’ll eat the coconut!” She was trying everything in her power to make sure the cake didn’t leave her house. I gently explained that I was putting it in the outside fridge and she’d still have plenty of cake for dessert. When the door was safely shut, I cracked up. It’s nice when someone makes you laugh.